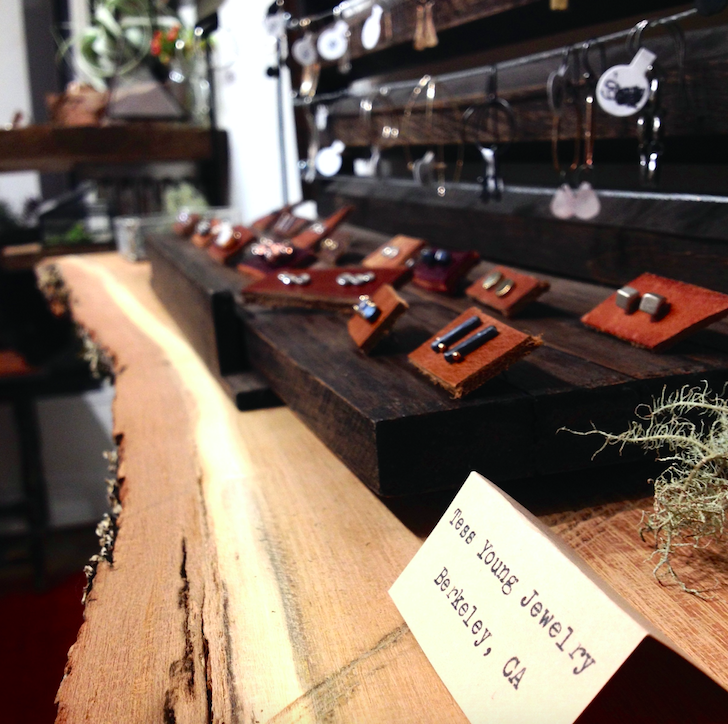 All Tess Young Jewelry pieces are made entirely by hand in my studio in Richmond, California. A lot of the inspiration for the forms I create come from some of the simplest and most universal shapes. In any piece's construction, I try to keep an accordance with the rough and unfinished shapes in nature, rather than the flawless design of mechanical structures. Imperfect circles, unique teardrops, asymmetric crescents. I am moved by the shapes in the sky- planets, constellations, and my unwavering love for the moon in all her faces. I am also drawn to particular stone shapes. Sometimes I can design a piece entirely around the natural curves of an opal or turquoise—its all based on what harmonizes with the mineral, not what manipulates or effaces it. Often, when I put pen to paper, my hand draws freely. My brainstorming process is best when I'm not thinking about what I'm drawing, and when I let the patterns on the page relate to each other. Some of my favorite designs were formed this way- by mistake- by allowing some improvisation of ideas to form and mesh together. Working at the bench, the process can sometimes feel like more of a construction than a creation. I get a lot of enjoyment out of the tactile nature of "fabrication,"—sawing, hammering, filing, soldering, sanding, polishing—so I tend to work in my studio for entire days without feeling the time pass. To make pieces that people will wear and cherish for years is one of the most flattering and humbling ways to make a living. I believe in the handmade in a digital age- creating well crafted pieces amidst a sea of mass-production. By being a traditional jewelry designer and using techniques that have been around for hundreds of years, I feel like I put a little bit of my spirit and energy into each piece. I hope that this aura translates onto the owner. Since my move to California in 2013, my love for gemstones and minerals has grown exponentially, more than I ever imagined it could. While I enjoy forming and designing the look of metal, I truly can fawn over the beauty nature has magically produced in these vibrant, rare treasures. The West has spoiled me with access to some of the largest gemstone shows in the country- not to mention the proximity to silver, turquoise, quartz and agate mines all over California and the Southwest. In this way I am able to hand select the vast majority of my gemstones straight from the source, from people who are just as excited about the minerals as I am. About half of my designs feature silver or gold that I personally recycle, and the rest is 100% recycled silver and gold sourced from New Mexico and the Southwest area. Having access to direct buyers of metal and stones not only supports local, ethical businesses— it also allows my work to reflect a strong influence from the materials around me. Questions about the studio process?